Since growing up and living in Montana, where the American bison has existed alongside Native American culture for thousands of years, I have been in awe of the power and grace of this iconic image of the American West. The bison personifies the West and its culture, roaming the prairies of North America in herds of 30 to 60 million during the 1800s. But by 1889, only 1,000 were left. 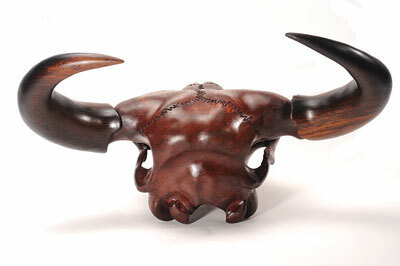 My curiosity to carve a full sized bison skull grew in 2009. I researched the anatomy of the skull for months before attempting to carve it, carefully gauging its anatomy to ensure accuracy. Finding a board of exotic wood wide and long enough to accommodate the width, height and length of a full sized bison skull was a difficult process but eventually I decided on a beautiful board of figured bubinga wood. As with any wood carving, I had to leave more than enough wood in the tooth section of the skull to get the desired effect of each tooth. Once I got to this part of the carving, I used a chisel and mallet to eliminate the palate section between the two rows of teeth. With this completed, I focused on the teeth themselves. Always referring to an actual bison skull, I drew the outline of each tooth on both rows; drawing the lateral (outside) aspect, then the bottom or 'chewing'side and finally the anterior (inside) aspect of each tooth. I then separated the teeth by eliminating the wood between them, accomplishing this with a variety of small 6mm (1/4) Dremel tool bits. Slowly eliminating the wood between the teeth, I gauged the accuracy of each tooth by comparing it to the real skull. Once I had each row of teeth completed, I sanded off each tooth. When carving teeth, sanding is the key to smoothness. I used a great deal of hand sanding with 400-grit sand paper as well as the Guinevere Sander from King Arthur's Tools. This sanding tool is a must for me and when used correctly can eliminate hundreds of hours of hand sanding. 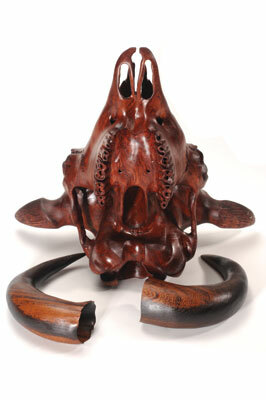 The most critical aspect of carving this skull was the exact placement of the eye sockets. Once I had these correctly placed and outlined, I could judge the accuracy of other anatomical points of reference, for example, the nasal cavity and the back portion of the skull. To get the cranial dips and valleys of the back of the skull, I used the Holy Galahad grinding disc to get it roughed out. I then used the Guinevere sanding tool to sculpt these dips and valleys. When carving from exotic wood, it is critical to get as much of the form you are trying to accomplish with a grinding disc due to the wood's density and hardness. From here, you can begin to sculpt with the sanding tool, slowly eliminating the wood you don't want. This takes a tremendous amount of time to do, but the end result is well worth it. To secure the horns to the skull, I used moulding clay on the inside so that the horn sticks to the skull and does not twist or fall off. 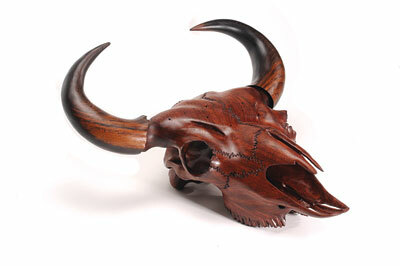 For the horns, I used a solid block of wenge wood, which beautifully represents the black horns of a North American bison. I traced the outline onto my block of wenge wood. From here, I cut the shape for the horn with a bandsaw and used a Holy Galahad grinding disc to create the natural shape of a real horn. When I had the horn shaped correctly, I used the Guinevere inflatable sander with 80-grit sandpaper sleeve to sculpt the horn into shape. I followed up with 150, 220, and 320-grit sandpaper - in that order - shaping and smoothing the wood along the way. Finally I finished up with 1,200-grit sandpaper and 0000 steel wool. To gain access or hollow out the inside of the horn, I drilled holes into the bottom and then began to use a No. 10 Fabrik-Marke chisel to eliminate the wood. This took a considerable amount of time to do and I was extremely mindful not to make the walls of the horns so thin that they would break. 'Big Medicine; A Tribute to the American Bison' took 8 months to complete from start to finish with over 500 hours of carving and sanding time. 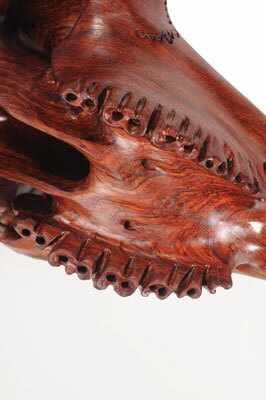 To view this or other Tom Dean carvings, please visit his website.